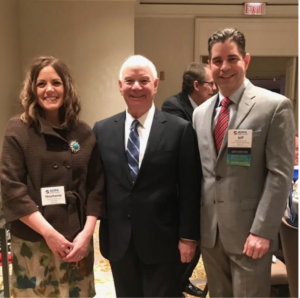 Jeff Brandt, CEO and Founder of Ability Prosthetics and Orthotics, along with Stephanie Greene, Esquire & Ability’s Chief Compliance Officer (pictured from right to left on either side of Senator Ben Cardin (D-Maryland)) attended the 2018 AOPA Policy Forum in March. Brandt, who now sits on the AOPA board, was pleased to attend an event that presented opportunities for O&P stakeholders to meet with Congressional representatives to improve patient care and advance other legislative objectives. Not pictured but no less important was Jeff Quelet, CPO & Clinical Management Officer for Ability. Recently, AOPA celebrated a legislative win, and the policy forum is all about access and integrity-first. Brandt says, “All the provisions/bills we spent the day lobbying for, either increase access to higher level of care for patients or works to enhance or protect the intregity of the programs that provide these O&P benefits.” Members and guests alike were eager to visit DC lawmakers to continue to push forward. In total 96 O&P professionals and patients participated in an astounding 500 appointments with legislators! The topic on all their minds was the Medicare O&P Improvement Act. This bill, presented first in May of 2017 by Senator Chuck Grassley (R-IA) and Representatives Glenn Thompson (R-PA) and Mike Thompson (D-CA) introduced S. 1191/H.R. 2599, the Medicare Orthotics and Prosthetics Improvement Act of 2017 in the 115th Congress (2017-18). The bill aims to separate O&P from durable medical equipment, and allow Orthotists’ and Prosthetists’ notes to be part of the medical record and more. Policy Forum attendees also requested support for additional funding for O&P research and education, expressed the importance of Veterans’ Choice (The Veterans Choice Program allows you to get your VA related health care from civilian doctors in your community. The program was designed to address VA’s delays in providing medical care, giving veterans faster access to healthcare, and took the opportunity to share other issues facing their patients and their businesses. On the first day of the Policy Forum, attendees heard from Congressional members Rep. Peter Roskam (R-IL) and Rep. Mike Bishop (R-MI). Both shared their views on healthcare, as well as any advice they had on advancing the O&P agenda. Those in attendance also heard from a panel of experts including AOPA staff, lobbyists, board members and more who all aided in ensuring everyone felt confident in their “asks” from lawmakers. On the second day attendees heard from Senator Ben Cardin and finalized their talking points and “asks”, and headed to Capitol Hill. The forum, held in March, was an excellent time to continue building momentum for the amputee community, as April is Limb Loss Awareness month! Find out how you can start a conversation here. AOPA staff will be following up with legislative staff to keep the ball moving forward. See more photos at AOPA’s Flickr site.